CES 2019: Axibio, an innovative and connected solution for the processing of organic waste. Thanks to a sorting machine and a web portal, local authorities and catering professionals can more easily recycle their organic waste. A start-up present at CES 2019, at the La Poste French IoT stand. Axibio has developed a machine for the sorting and compacting of organic waste, combined with a web portal for the digital management and monitoring of this waste. Designed for local authorities and all catering professionals, this smart platform is a global solution for the processing of food waste, so that it can be recovered through anaerobic digestion or composting. Created in October 2016, Axibio is a start-up managed by its two founders, Pierre-André Galy and Marc Eyraud. Galy has over 16 years of experience in the steel industry, and Eyraud has worked for over 23 years in the environmental sector. Thanks to a shared interest in waste management and energy, they decided to combine their skills in a project together. Thanks to this innovative and connected solution, Axibio helps catering professionals and local authorities to take part in a green initiative, in a simple and digitised way. 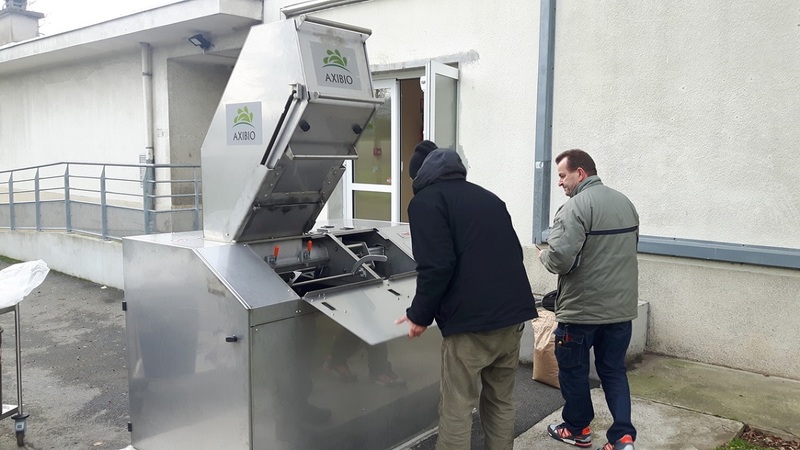 The A-600 machine, developed by the start-up, allows the compacting of organic waste, works with a web portal to provide a direct connection with the recovery unit, and helps to reduce logistics costs. Axibio develops innovative solutions and facilities, which are subject to three European patents, for the processing and recovery of this organic waste. A-600 is a connected compacting and sorting error separation facility. It helps to reduce sorting errors, continuously measures the weight of waste, and consumes very little electricity. This machine, connected to the Axibio web portal, allows digital administration and regulation. This includes the creation and archiving of accompanying commercial documents, keeping a register of non-hazardous waste, annual reports and a library of regulatory texts on waste sorting. This platform provides indicators on food loss and monitors the recovery of organic waste (energy production dashboards, information on the production of organic amendments). This innovative organic waste recovery solution has a strong environmental impact. Waste is monitored and recovered as biogas or compost. In economic terms, Axibio helps to reduce collection, processing and management costs for food losses. In operational terms, bin rooms and yards are less cluttered (less bins), sorting is optimised, and hygiene is improved. On this basis, Axibio sells two offers: one for community and commercial catering professionals, and the other for local authorities wanting to introduce selective collections for households. The company initially sold its offer to private high schools. It won a first contract to equip a local authority and a waste management union in Brittany for the collection and processing of household organic waste. Axibio won an award under the French Tech Emergence Programme in 2017, and in the 2018 French loT Programme from Le Groupe La Poste. Recently, it won the “Grand Jury Prize” at the innovative services awards held by EY and WikiPME in September 2018. More information is available on the Axibio website.